Ideal for students to learn core physics concepts. Set up and execution are simple, so you can spend more time engaging your students. Ideal for introducing a unit or using as reinforcement after a lesson, these demos are available for all fundamental physical science topics. Use the infamous “tablecloth pull” as a quick, yet memorable demonstration of inertia. Allow your the students to set the table with included tableware and materials, then enact a swift, firm table cloth pull. In repeat settings, students explore the different responses to how quickly or slowly the tablecloth is pulled off the table. 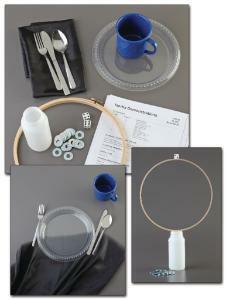 Includes a tablecloth, plate, silverware, cup, hoop, dice, plastic jar, and washers.